The Freedom Petals flower event to support the Friday Night Aleethia Dinner 16 September sponsored by the Ledo Club was a huge success. The flower collection during the week was not so successful because fall brings lots of potted plants instead of bouquets. So as usual when I request our creative volunteers to bring some flowers they always come through. Also, Barbara Levermann from the Western Fairfax Women's Club and the Chantilly Garden Club brought 4 coolers full of flowers and beautiful greens from their gardens to supplement our event. I can't thank her enough and her crew for these perfect donations. My special partner for the last seven years Anne Harvey from the Herndon Florist donated a huge multi-colored box of Alstroemeria. She is always our angel. 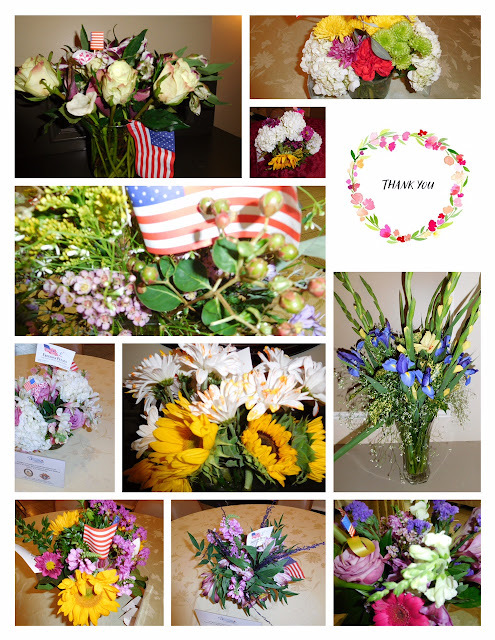 Ten volunteers came to work and create over 40 arrangements for the dinner tables and for everyone to bring back a special flower to Walter Reed. We had two new Freedom Petal volunteers (Betty and Jane) that helped to make the flags and silk flower pens for the Walter Reed Nurses. Thanks to all for your time and passion you give each month! What a night! With 20 "playful" children in attendance, we definitely needed the flowers to make the environment of the room more relaxed and happy while providing increased levels of positive energy! Everyone left with smiles. Also, some of the extras bouquets brought smiles to patients staying at the Fisher Houses. The floral pens headed to Building 10 (WRNMMC) and were given to nurses on several wards. Looking forward to seeing you in November!